Most people know that as an adult, our recommended salt intake is no more than 6g per day. Most people also know that a baby on their first solid food should only eat food with no added salt. However, I have found that there is little guidance available for those stages in between. I have a healthy happy toddler who, other than her lunchbox meals at the childminder, eats the same meals as me. When I cook, I am always conscious of ensuring that our family meals have a low salt content but it is hard to know where the limits are. How much salt should my toddler eat? The Food Standards Agency state that under 12 months, babies should have less than 1g of salt per day which they will get from their breast or formula milk. From 1-3 years old, this increases just a little. I am naturally someone who reads the labels of food. Partly because the ingredients on many of the foods I buy fascinates me. Generally I won't avoid a food for me and Mr. B. if it contains scary ingredients but I do like to know and understand what I'm eating. For Lara, things are a little different, I like to buy her food made from natural ingredients and with a low salt and sugar content (i.e. no added salt or sugar). Over the past 12 months I have learned some interesting things by reading the labels on baby foods and adult foods more closely than I did before. For instance, we are often told to buy breakfast cereals made exclusively for babies to ensure that they contain low levels of salt. In Lara's early days of weaning we tried some great cereals from Plum Baby and Organix but soon I discovered that the breakfast cereals that Mr. B. and I normally eat don't contain any added salt or sugar either. I KNOW all too well that this is not the case for many of the “children's” breakfast cereals on offer but it did teach me that I don't need to pay extra for 'baby' food just because it has the word 'baby' on the packet when there is a perfectly reasonable non-baby equivalent which is just as suitable for her to eat. Not every food product that we used to buy in the Mellow household is now suitable for us to share with Lara. One of the most significant changes that I have made to the way I cook is the brand of stock cube that I use. I know that the best way for me to control the amount of salt in the stock I use is to make it myself from scratch! I do make my own, very occasionally, after a good roast dinner. More regularly I use a stock cube. I had heard that there was such a thing as a 'baby stock cube' and I assumed that it was another one of these things that you pay more for just because it has the word 'baby' on the packet. That was, until I actually compared the salt content of my normal stock cube (I was using Oxo) with the salt content on the Boots Baby Stock Cubes and the Heinz Baby Stock Cubes. The difference was phenomenal. "If a baby has too much salt in their diet, it could strain their kidneys as they are not developed to handle large amounts of salt. 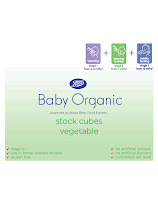 The Boots Baby Stock Cubes contain less salt than regular stock cubes to help control salt levels. When babies are weaning, we don't advise parents add salt or sugar to their food." The Boots Baby Stock Cubes are available in Chicken, Beef and Vegetable flavour. They are quite soft in texture and subtle in taste. I find them a little more difficult to break down so I have to mix them carefully in hot water rather than just bunging one in to a dish. Both myself and Mr. B. thought that we would be lacking that little something in our meals with a 'baby' stock cube but we actually quite like the flavour. 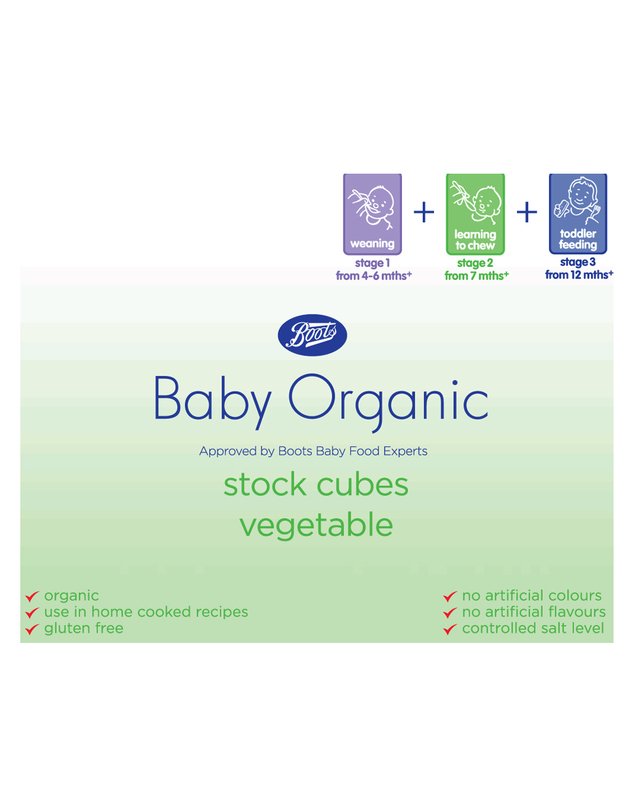 Boots Baby Stock Cubes are organically certified and free from artificial colours, flavours, preservatives, egg, gluten, milk and soya so are suitable from the very early stages of weaning. There is little to choose between the different brands of baby stock cubes. Despite assurances from Boots to the contrary, I have my suspicions based on ingredients, nutritional content, packaging style and country of origin that they originate in the same place... they certainly look and taste similar! The Boots Baby Stock Cubes are the most easy for me to regularly lay my hands on. I have found that Kallo stock cubes (without the word 'baby' on the packet) are also quite a lot lower in salt than some of the better-known brands. Kallo also do a 'very low salt' version which has the same salt levels (and ingredients, packaging and country of origin) as the baby stock cubes but they are very hard for me to find in the supermarkets. If you are interested in finding out more about how to feed your toddler a healthy happy diet, you may like to visit 10 Steps To a Healthy Toddler at Little People's Plates. You'll find some great guidance.